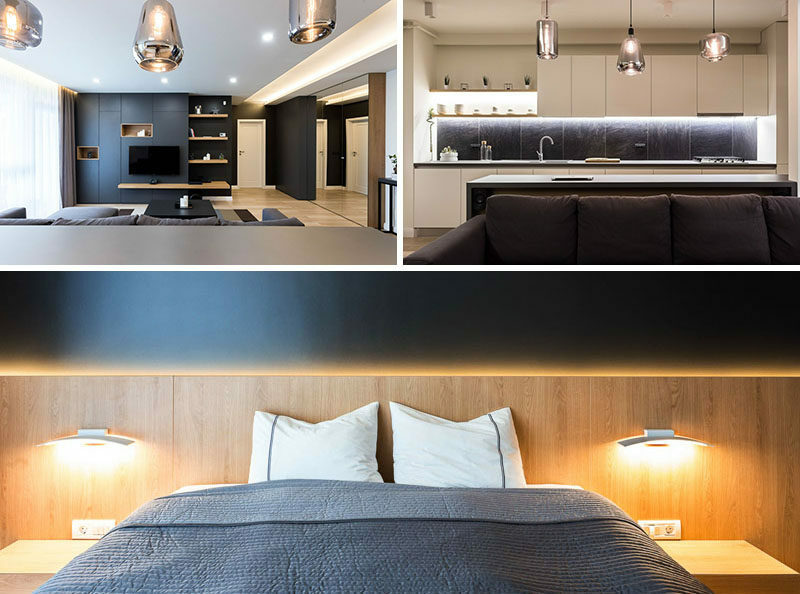 Design studio Davidsign have recently completed the interior renovation of an apartment in Oradea, Romania, for a young man who wanted a simple and modern, yet cozy and calm space with touches of Scandinavian influence. 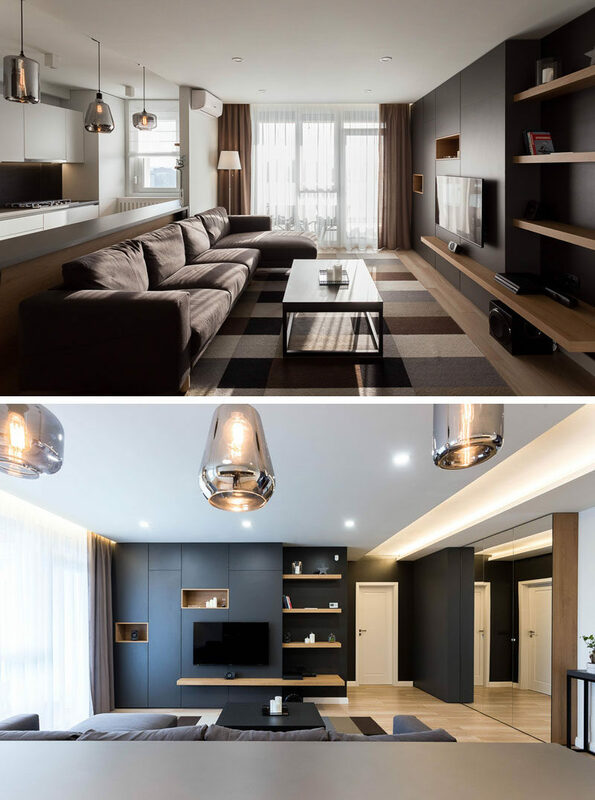 Throughout the apartment, like in the living room, the designers worked with a simple color palette of white, grey and black, with touches of brown and wood to help create a warm atmosphere. As part of the renovation of the apartment, the wall between the living room and the kitchen was removed, allowing for single open space. This also created space to have a bar table that also acts as a physical division between kitchen and living room. As the client didn’t require a large dining table, the bar table doubles as a dining area, a desk and as extra space when cooking. Hidden lighting underneath the upper cabinets and the exposed shelving, help to keep the kitchen bright. In the bedroom, a black wall has black and white photography as art work, while wood runs along the bottom half of the wall and creates a headboard for the bed. Hidden lighting and bedside lighting create a soft ambient lighting for the room. In the bathroom, a cabinet on the wall creates plenty of storage, while wood lined open shelving is the perfect place to display some simple decor. 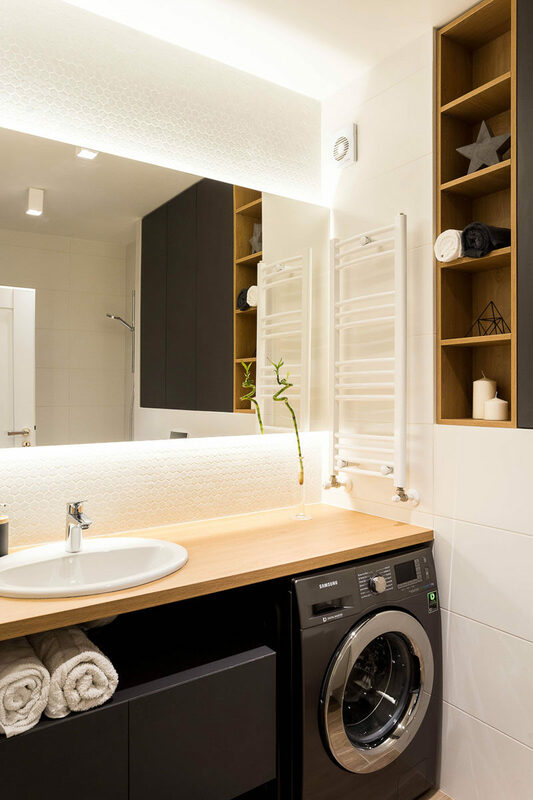 The mirror above the vanity is backlit on the top and bottom, while underneath the vanity there’s additional storage and the washer/dryer.